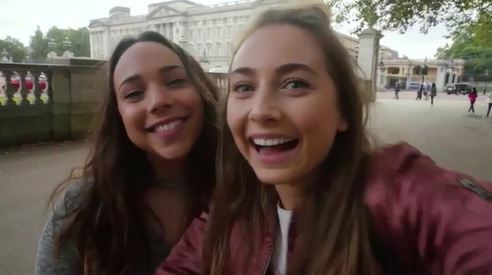 Home > Neighbours Webisodes > Pipe Up - Part 16 - London, Baby! Name of Webisode: Pipe Up Part 16: London, Baby! Piper is standing on a path at the side of the Thames. 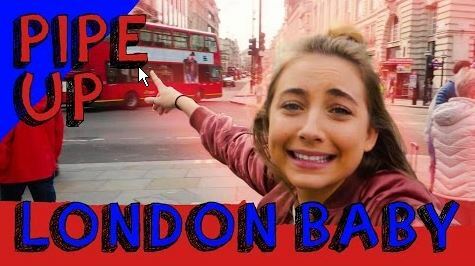 PIPER: I am in...LONDON, BABY! She points excitedly to the London Eye behind her. Suddenly, Imogen comes into shot! IMOGEN: OK, OK...I really wasn't going to get involved, but I cannot let you talk like that! Piper has got her arm around Imogen's neck and is jumping up and down. PIPER: Did someone say the Willis family reunion?! Imogen is laughing at Piper's antics. IMOGEN:(about the camera) No, you keep that on you! She moves out of shot. Imogen comes into shot again. PIPER: Imogen, are you in or are you out? Make up your mind! Piper is now outside the Houses of Parliament. She winks at the camera. IMOGEN: That's completely inappropriate, Piper! I'm pretty sure that your viewers might know what this thing is, are your vlogs always like this? Cut to the banks of the Thames. PIPER: So, here we are at London's Big Wheel...so if you've been to the Big Spinny thing in London, just comment down below. IMOGEN: There we go, best tour guide ever! Cut to a red telephone box. PIPER: Oh, is it ringing? She picks up the receiver. PIPER: Hello? Mum! Dad! Lauren, hello...yeah, I'm with her right now. (To Imogen) They want you to explain why you weren't at the wedding? Imogen just looks at her. IMOGEN: Go on, say it. PIPER:(excitedly) Piccadilly Circus! Red buses! IMOGEN: Oh, yes, they're sooooo different to the Melbourne buses! They're like, red and oh...that's about it. PIPER:(to the camera) Daniel, why? Why? How?! How do you love her? IMOGEN: Hey, hey, hey, I love you! She kisses Piper on the cheek. Cut to a pelican crossing. IMOGEN: What was that? What do they do in Australia? PIPER: If my subscribers hear it again, they'll go back. IMOGEN: If you love pigeons, you have come to the right place! PIPER: I do, I love pigeons! Especially Lassiter's. She points into the camera. IMOGEN: What does that even mean? IMOGEN: OK, do I care? IMOGEN: Gary's a creative man! PIPER: And he kind of has a crush on Mum. IMOGEN: No, he doesn't! That's disgusting, stop it. She puts her fingers in her ears while Piper smiles at the camera. Cut to the centre of Trafalgar Squares where Piper is looking at the statues of the lions. She points at the lion. PIPER: I found you! Look, it's you! Well, it's not you...not sure if Mum would be too pleased if I brought a cat home that size. IMOGEN:(sarcastically) This is sooo thrilling. I love that we're doing this instead of being at the National Gallery. Any chance we could go? Cut to outside Buckingham Palce. PIPER: Ladies and gentlemen, the slowest walker in the world. IMOGEN: Oh, shush, I can't cope with you right now. IMOGEN: Oh, you *will* be sorry when you're carrying me home. They look at the guard standing outside the Palace. PIPER: It's such a boring job. PIPER: I saw this YouTube compilation of people messing with them...it's funny. IMOGEN: So, you mean you watch really disrespectful people disrespecting the Queen? PIPER: Say 'disrespect' one more time. PIPER: What are they called again...the...? IMOGEN: Beefeaters? (To the camera) Beefeaters. It actually is...I think so. IMOGEN: No, I genuinely think that's what they're called. Why do you reckon? PIPER: Comment down below if you know why they're called Beefeaters. IMOGEN: I just felt a little drizzle. Now you know you're in London! Cut to the other side of Buckingham Palace. PIPER: So, that's it for another episode, guys...I hope you liked my tour of London. IMOGEN:(sarcastically) I know *I* loved it! PIPER: Don't forget to subscribe and keep watching for more videos. PIPER: Oh, OK, is that what we're doing now? Is that what's happening? IMOGEN: I'm just going to start my own channel, I think, after all this...I think I should start one called 'Imogenation'! IMOGEN: Ah, OK, coming from the chick who started 'Pipe Up', what do you do, sell tobacco? PIPER: That's it, so (British accent)...cheerio! PIPER: Oh, and Merry Christmas!